This is Part 2 of a multi-part story of one woman’s journey leaving Christian Science. For all posts see ‘Spice‘. I have been unable to see properly for at least half of my life. While a lot of modern day Christian Scientists don’t go to doctors, many of them do go to eye doctors, because Mary Baker Eddy herself went to eye doctors. Eye doctors and dentists are exceptions to the rule of not seeking medical care — but that’s a whole ‘nother article. For now we’ll just leave it with the concept that Christian Scientists are allowed, under religious doctrine, to go to eye doctors and get and wear glasses. Even though both of my Christian Scientist parents wore glasses, they didn’t know how to help me navigate what I feel is the labyrinth of optometry. I first found out that I needed glasses at the DMV, testing for my driver’s license at age 16. Having been raised by Christian Scientists, I was exempt from vision screening in school. I was also exempt from health class, scoliosis screening, hearing screenings, and vaccinations. I was at the DMV after a rough driver’s ed experience in school. I didn’t pass the course and needed additional hours with the instructor which took additional time, cost additional money, and further inconvenienced my parents who had to transport me. Within my family, I got a reputation as being a bad driver. After the DMV, my mother took me to Wal-Mart for an eye exam and to buy a pair of glasses. I remember being scared and frustrated and crying during the exam, because he was asking me which lens I “liked” better, and I didn’t know. I didn’t know by what criteria I should like one lens over another, and I was very scared at my first experience at a doctor’s office. I remember when I first put them on and looked across the big store, I could now read the signs across the ceiling. The first time I wore them outside I reveled in the ability to see each individual leaf on a tree. Being able to see was amazing, and driving became much easier. I don’t think I got another pair of glasses until I was away at college, a couple of years later. Why would a good Christian Scientist get their eyes checked every year? That would be acknowledging the idea of mortal decay and giving it power. Well, I accidentally left my glasses on a desk in a classroom and never found them. In a panic, I had to figure out how to get — and pay for — another pair of glasses. 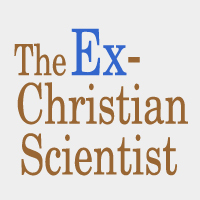 And why would a good Christian Scientist have a backup pair of glasses? That would be acknowledging that things can be lost, which is error. Question. — What is error? lose the standard of Truth. I found a coupon in the newspaper for a $25 exam, which sounded great to me, being on my own financially. I went to Wal-Mart to pick out a pair of frames and get an idea of the price. (After all, my mom had taken me to Wal-Mart for glasses. Isn’t that where everyone gets glasses?) Then I went to the optician designated on the coupon for my eye exam. Afterward they asked if I’d like to look at frames, and I said I could not afford the glasses that they sold there, and that I needed my prescription to take to Wal-Mart. They did not want to release my prescription, and I didn’t know how to advocate for myself or the law stating they were required to give it to me. So I bought from them glasses that were out of my budget even after discounting. (The coating wore off of those glasses before my year warranty was up, and those bastards charged me for “shipping” to replace/recoat the lenses.) I was at this shady place because I didn’t know about medical insurance, what I had access to via my parents or the university while in college, or that I could have had a proper exam from a non-swindling eye doctor. I didn’t know that non-swindling eye doctors existed until several years later, and I hated “the glasses racket” and treated it with proper disgust and distrust. In reality, people lose or break glasses all the time. It’s so common that it is normal to have a “backup pair” of glasses so that this exact situation does not happen. My prescription was expired, so I had to do another “fire drill” to get replacement glasses in a hurry. You can bet I didn’t go back to those bastards for a $25 eye exam. After graduating college, I had a reimbursable cash incentive from my employer for medical expenses. Because I was driving slowly when approaching signs, the coworkers I was on a business trip with suggested that it was time for new glasses, which was embarrassing. I found an independent eye doctor and got an exam. He suggested that I get my eyes checked every year. I didn’t even know that was a thing. I got eye exams every year for the four years that I had that job because of this reimbursable cash account. The next time I went to this doctor for an eye exam, he said that my prescription had changed only slightly and started to write a new one. I begged him not to change my prescription if it was only slightly different, because new prescriptions gave me horrible headaches. I remember the look he gave me, like I had just asked him to commit a felony. I didn’t learn until 10 years later that headaches upon getting a new glasses prescription is not uncommon, but in the meantime this reinforced my disgust and distrust in what I perceived as being “the glasses racket”. After I graduated and started my next job, the first thing I did was to get Lasik. It had been about four years since I had had an eye exam and gotten new glasses, and the doctor thought that my prescription was stable. Lasik was a terrifying experience, but was well worth the emotional upheaval. I remember seeing every individual snowflake falling outside the window the next morning with my naked eyes. I proudly went to the DMV with my Lasik letter to get the corrective lens restriction removed from my license. I could see as soon as I woke up everyday! Life without glasses was SO FINE. A little over a year later, I was in an accident that caused a vision problem called Purtcher’s Retinopathy. It took a while to diagnose and affects the retina — a different part of the eye than Lasik fixes and which glasses corrects (the cornea). While signing myself into the ER after the accident, I asked if the pen worked because I couldn’t see my signature on the admittance paperwork. The ceiling tiles were also fuzzy as I laid in the ER bed. But, we had much bigger fish to fry (injuries to treat), and the doctor said that the accident probably kicked up floaters, that my body was under stress, and that it would clear up. time I bawled my eyes out because I couldn’t see. Fun fact: there are no criteria for a doctor clearing you to drive after you have vision problems. I asked about the fact that it took me 10 seconds sometimes to make out a letter and the several times that, as a passenger, I did not see a scooter, small, neutral-colored car, or pedestrian. They said to just “use my judgement.” My husband drove me to all of my appointments and to work for six weeks. Then he needed to go on a business trip, so I started driving again. I got a new GPS and used voice prompts and drove slowly. By the 4-month point, I was testing at 20/35, which was close enough to 20/30, the legal requirement for driving. This should scare the hell out of you. It scared the hell out of me. A year after the accident, I passed a DMV vision test and my retinologist said that my retinas looked just as good as any adult’s off the street. Life went on for a couple more years. I started treatment for migraines that included medication. I didn’t feel like I could see very well and blamed it on the meds, like a good semi-pseudo-sorta-former Christian Scientist. In fact, after a few days on one medication, I almost missed a school crossing guard, and immediately quit taking that medication. It got so bad that I avoided driving at night as much as possible and drove very slowly on exits and when taking turns. I thought to myself: ”I am too young to be having these kinds of vision problems and limitations.” I read about blurred vision in my medication side effects. (Spoiler alert: they ALL say this.) I discussed this with my doctor, and we slowly reduced the medication until I no longer took it. My vision improved slightly, but was still so bad that I couldn’t read signs across the room. My husband told me to try on his glasses. Goddamnit, it was time for new glasses. AGAIN. At this point, it had been 4 years since I got Lasik, and my eyes kept deteriorating. I’m sure that some of my Christian Science family members blame my having gotten Lasik for needing to wear glasses again. I didn’t solve my vision the “right” way, through prayer. Yeah, ok. So it turns out that I will not achieve my goal of cutting the glasses industry out of my life. But now (I think) I know how to deal with it like a rational adult. I now have not only one pair of backup glasses, but also a fashion pair, plus prescription sunglasses. This feels like pure luxury. glasses for over 8 months. I have major emotional baggage when it comes to glasses and vision. What I went through was completely unnecessary thanks to 14th century technology (glasses) and middle-class means (the ability buy a backup pair) during modern times when vision screening is mandatory during elementary school (unless you have a religious exemption). I have been terrified of driving, made to feel like it was my own fault that I couldn’t see, felt swindled, despaired that I would never be able to see again, and I committed a felony. My troubles didn’t occur in 1900 — this was Anno Domini 2000+. Except that for Christian Scientists, it may as well have been 1900s — medically speaking. You’ve completely captured the essence of my issues with CS. I once fainted from pain at my back door. I didn’t know I could go to ER. Over the next few days, I became weaker and weaker until a friend insisted I go to a hospital. I had been bleeding internally for 5 days and had sepsis. Near death, I submitted to medical care which included a hysterectomy. I was 28 years old at the time. I have so many horror stories from just not knowing what to do about situations around my body. Thanks for articulating this so well.